The prolific novelist E. F. Benson is celebrated for his hilarious satires of upper-middle-class life, as depicted in the ‘Mapp and Lucia’ novels, and for being an adept narrator of ghost stories. 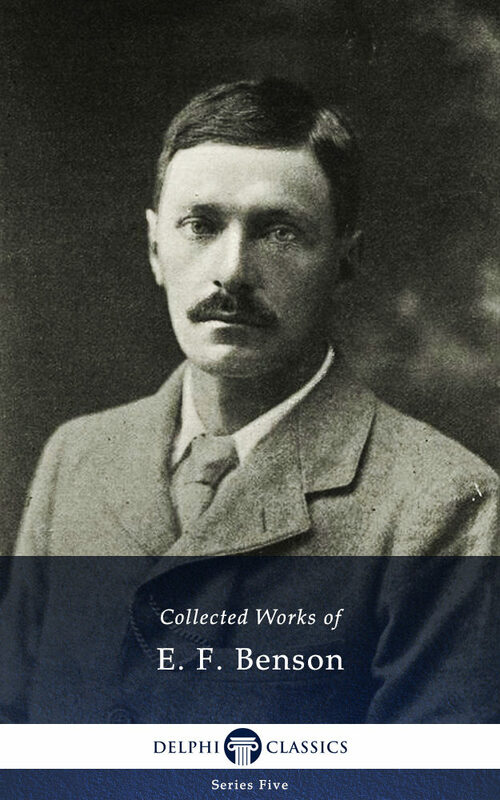 This comprehensive eBook presents the largest collection of Benson’s works ever compiled in a single edition, with numerous illustrations, rare texts and concise introductions. (Version 1) * Beautifully illustrated with images relating to Benson’s life and works * Concise introductions to the novels and other texts * 32 novels, all with individual contents tables * The complete ‘Mapp and Lucia’ novels - all six novels, linked in series order * Many early and late novels available here for the first time in digital publishing * Images of how the books were first printed, giving your eReader a taste of the original texts * Excellent formatting of the texts * Rare short story collections, appearing here for the first time in digital print * Special chronological and alphabetical contents tables for the short stories * Easily locate the ghost stories you want to read * Includes a selection of Benson’s non-fiction * Features an autobiography - discover Benson’s literary life * Scholarly ordering of texts into chronological order and literary genres Please visit www.delphiclassics.com to browse through our range of exciting titles CONTENTS: Mapp and Lucia Series QUEEN LUCIA (1920) MISS MAPP (1922) LUCIA IN LONDON (1927) MAPP AND LUCIA (1931) LUCIA’S PROGRESS (1935) TROUBLE FOR LUCIA (1939) Other Novels DODO: A DETAIL OF THE DAY THE RUBICON THE JUDGEMENT BOOKS LIMITATIONS THE BABE, B.A. MAMMON AND CO. SCARLET AND HYSSOP THE ANGEL OF PAIN THE HOUSE OF DEFENCE THE BLOTTING BOOK DAISY’S AUNT THE OSBORNES MRS. AMES DODO’S DAUGHTER THORLEY WEIR ARUNDEL MIKE DAVID BLAIZE UP AND DOWN ACROSS THE STREAM ROBIN LINNET DODO WONDERS LOVERS AND FRIENDS PETER PAYING GUESTS RAVENS’ BROOD The Short Story Collections SIX COMMON THINGS; OR, A DOUBLE OVERTURE THE ROOM IN THE TOWER, AND OTHER STORIES THE COUNTESS OF LOWNDES SQUARE, AND OTHER STORIES The Short Stories LIST OF SHORT STORIES IN CHRONOLOGICAL ORDER LIST OF SHORT STORIES IN ALPHABETICAL ORDER The Non-Fiction CRESCENT AND IRON CROSS CHARLOTTE BRONTË The Autobiography OUR FAMILY AFFAIRS Please visit www.delphiclassics.com to browse through our range of exciting titles. Otros ebooks de E F BENSON.